Unipak Nile meets Occupational Health and Safety Management Systems (OHSAS) standard requirements for "Design, Manufacturing and Sales of Corrugated and Specialty Paper Packaging Products". By achieving OHSAS 18001:2007 certification, Unipak Nile ensures that occupational health and safety policies meet legal requirements addressing risks in the industry. The corrugated packaging manufacturer implements effective risk management systems that improve performance by identifying, controlling, and reducing health and safety hazards and accidents in the workplace. TÜV SÜD Management Service (Bayern) Egypt Branch (TSMSE), certifies that Unipak Nile passed the re-audit, according to BS OHSAS 18001/2007 standards. 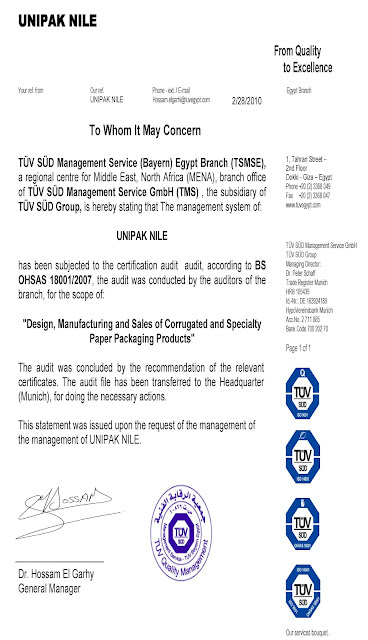 The OHSAS surveillance audit, conducted by Mahmoud H. Eltaieb, auditor from TÜV SÜD Egypt, took place at Unipak Nile plant in in 6th of October City, Egypt, on 9 July 2012. What did the OHSAS 18001:2007 Surveillance Audit Evaluate? BS OHSAS 18001, the internationally recognised standard, provides a framework to help companies identify, control and reduce risks associated with health and safety in the workplace. OHSAS 18001 aligns with ISO 14001:2004 standards to help organizations develop integrated management systems and implement risk assessment processes with appropriate risk controls. The certification is also compatible with ISO 9001:2000 standards.